A mezzotint after a portrait of Sir David Wilkie; three-quarter length, seated before an easel, his body turned to the left. He looks up to the right, and holds his brushes and a palette in his left hand. Inscribed below: Engraved by John Young, Engraver in Mezzotinto to H.R.H. the Prince of Wales, from a Picture by / Sir William Beechey, R.A. / David Wilkie A.R.A. / London Jany 1 1810 Published by the Engraver 65 Upper Charlotte Str.t Fitzroy Sq.r. Sir David Wilkie (1785–1841) was only 24 years old when this portrait was published, yet he was already a celebrated artist. Born in Fife, his early training in Edinburgh followed the conventional curriculum of drawing from casts and attempts at grand historical and mythical narratives, but he soon realised his vocation as a painter of modern genre. He moved to London in 1805, where his exhibitions at the Royal Academy of Arts of the Village Politicians in 1806 and The Blind Fiddler in 1807 were met with popular acclaim. Sir William Beechey was one of Wilkie’s keenest promoters in his early years in London, putting his weight behind Wilkie’s candidature to be made an Associate of the Royal Academy (which he achieved in 1809), and advising Wilkie on how to ingratiate himself with the Academicians. This mezzotint reproduces a portrait by Beechey (Scottish National Portrait Gallery, Edinburgh), apparently begun spontaneously. 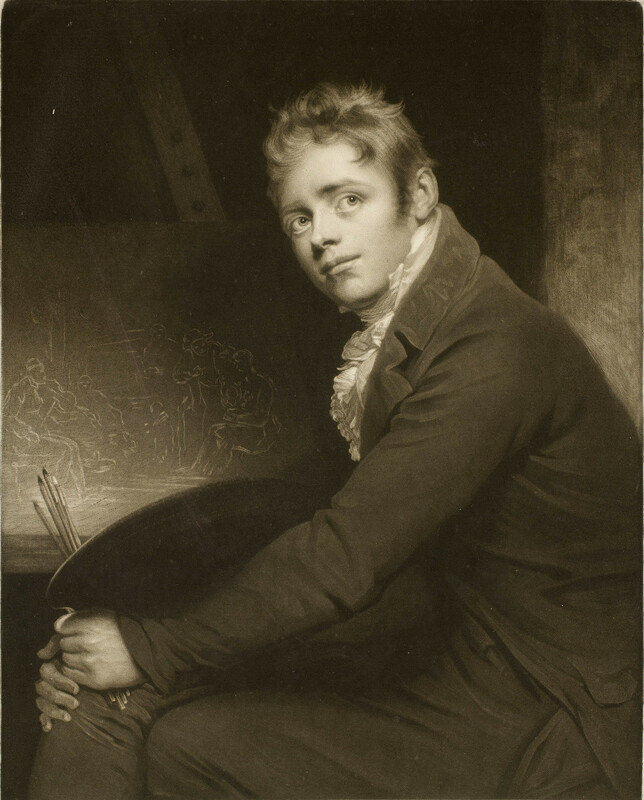 Wilkie’s journal for 15 October 1808 records: ‘Went to … Sir William Beechey.… Sir William desired me to sit down till he made a sketch of my head; he then began on a kit-cat canvass [36 × 28 in] to lay in the groundwork of a portrait, which he succeeded in doing before 2 o’clock.’ Wilkie sat sporadically to Beechey over the next six months and the portrait was exhibited at the Royal Academy that summer. Wilkie’s earlier self-portrait (also in the Scottish National Portrait Gallery) shows a self-consciously serious young man, his eyes cast in shadow, resting his hands on a portfolio and clutching his porte-crayon. Here the mood is lighter: the well-dressed artist sits in a casual pose, holding brushes and a palette, his hands clasped around his crossed knees, looking up to the light source with an insouciant expression. Not every patron wanted his artists to appear earnest or melancholy.